First and foremost, 700cc is YOUR club. Once you are a member you can ultimately ride how you wish to. Long, short, slow, fast, social or training. The key to keeping it inclusive is to take ownership! The onus is on you as a member to say what you wish to get out of your riding and encourage your fellow riders to do the same: suggest routes, pace and distance and encourage like-minded riders to join you. Some of you will want simply to spin your legs on a social ride, others will want to ride Tempo while others may wish to test themselves on hilly endurance rides. Remember, the more people who speak up, the more options there will be for everyone and the more miles we will all ride – and that can only be a good thing! As of Saturday 6 May 2017, new riders will be welcome to join any Saturday ‘Easy’ ride, by way of an introduction to the club. Meet at 700 HQ at 08.50 for the ride brief. The ride leaves at 09.00 and will start on time. No brief – No ride. These Club Introduction rides are mandatory for new and prospective club members. They will be run by experienced club members and are an excellent way see what 700cc is about. The rides are essential for developing core group riding skills essential in ensuring the safety of all riders. The Easy or Introductory ride will follow one of a number of prescribed routes each week to help those building their group riding skills and fitness progress without the added distraction of unfamiliar routes. Once you are comfortable or ‘green-lit,’ you can progress to any other group ride you choose! The rides take place at a casual pace for control and safety and will last around 2 hours. This ride is a new regular feature of the club calender to be held the first Sunday of every month; a chance for all of our riders to get togther and ride as fast, or as slow, as they like. Ending up like all good rides, with a cafe stop. We wanted to make this ride inclusive; to cater for those who want to take it easy and those with a preference for speed and suffering. We also wanted to create a safe enviroment where people could take a step up in pace, without worrying about getting lost, dropped or ruining someone elses ride. – Last group to leave is a no-drop group. As all groups will be folllowing the same route, if you find that you can’t hold the pace of the group you are in you can drop off and get picked up by the next group. – You may be riding fast (or not) but that doesn’t mean you can ride like a douchebag, keep it predictable etc. – Riding in a group that is slightly too quick for you and then fighting tooth and nail to hold on to that group is worthy of lots and lots of kudos and probably free coffee! – No matter how long you have actually been at the coffee shop when the next group arrives you must pretend that you have been there for hours, if not days. Meet at 700 HQ at 08.50. Turn up if you want to ride. Simple. The ride begins at 09.00 with staggered starts depending on pace. The route will be decided by those organising and will be posted in the closed 700CC Facebook Group ahead of time. We have teamed up with neighbouring club Thames Velo to encourage local riders to meet for a training session. All welcome! Meet at the entrance to Foliejon Park on the Drift Road (marked with the 700 logo on the course map) at 18.45 for the ride brief. No brief, No ride. 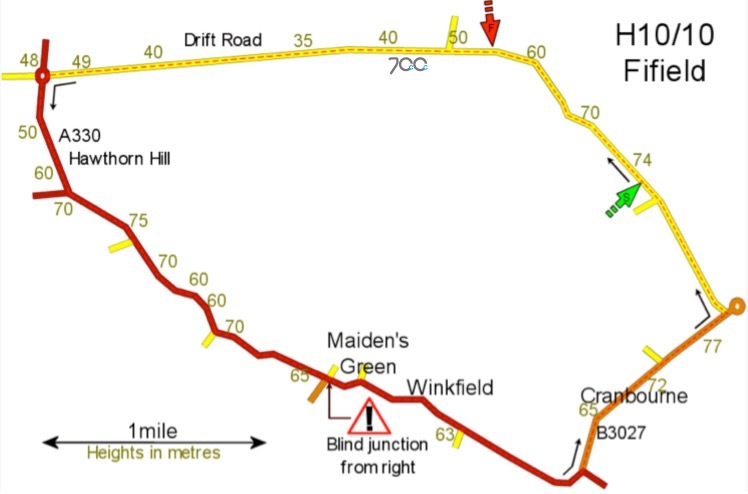 The circuit is the H10/10 course (10 mile loop), on the Drift Road. We will be working on group riding technique and developing speed. Open to everyone, riders will be grouped by ability for maximum benefit. Please Note: Chaingang is seasonal and is light dependent. “The original 700 ride took place on a Sunday for the simple reason that it was the only day staff and customers could ride together for a reasonable distance before we had to get back to the shop to open up. As a consequence of our ‘rattling out a quick fifty’ on a Sunday, we got something of a reputation in the local area for being fast and disciplined – a good reputation to have but one that would often deter others from joining – even though most would have slotted right in! Since those heady days, the club has grown and the ride format has altered. The Original Sunday Ride remained aimed at more experienced, faster and disciplined riders so they can have a good run out. With that said, the Sunday ride is still a social event and not a full-on Chaingang – we would encourage Saturday club riders looking to ‘up their game’ and perhaps push themselves, to join in. It is worth knowing that you may get dropped on occasion, but it is far more important to realise : THERE’S NO SHAME IN THAT! We have all been the last man, we’ve all been dropped. It is part of your development as a cyclist to know how and when to push yourself, digging deep to hold the wheel is hugely satisfying and is ultimately how we all become better! Dave B – El presidente.